When the weather starts to turn warm, I get nostalgic. I was thinking today about a vacation I went on with my family when I was in elementary school. We started in Kansas, went north to Mt. Rushmore, then headed west (while meandering) to Yellowstone park. It was a trek, and it was incredible. 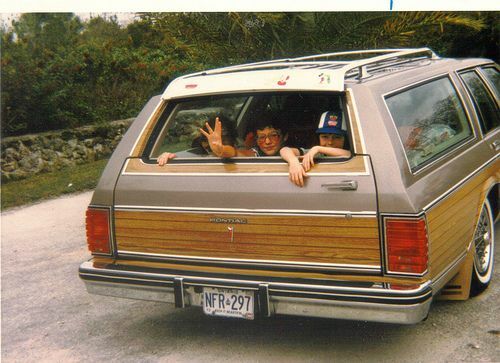 For much of the trip I rode in the very back seat of my parent's Buick station wagon, which meant that you faced backwards the entire time. It's amazing how many details I remember, and I was only in the third grade. I wonder if people still go on trips like this? I'd wager not as much due to higher gas prices and lower airfares (I'm looking at you, Southwest). Anyway, do you all have childhood vacation memories to share? My parents divorced when my brother and I were very young. My mother remarried and we moved to a different state far way from where my father lived. Because of the distance, we were only able to visit him once per year for a week at a time. In 1979, my father was able to convince my mother to let us visit for an entire month. Thankfully, she agreed, albeit reluctantly. I was only 12 at the time and my brother was 15. My father took full advantage of this opportunity to take us on an epic journey out west. The three of us loaded up in a Mercury the size of a small yacht and took off from SE Arkansas. Our route took us down to El Paso, over to Tuscon and Old Tuscon (where they shot many of the old western movies), Tombstone, the Grand Canyon, the redwood forests in California, back through Vegas and Utah, stopped in Denver for the NHRA Mile High National drag races, then across Kansas and back down to SE Arkansas. It took every bit of two weeks and there were a lot of other attractions and stops. It was the best vacation I have ever had. Your timing of this question is very relevant. While digging through some old photos recently, I stumbled upon a box full of 8mm film rolls. They contained footage from that very vacation and I just dropped them off this week to get digitized so that I could preserve them longer. I can't wait to see it. Oh man, that would be an epic trip. It sounds like the drag racing was the cherry on the sundae. It was. My dad was really into car racing and wanted us to experience it at an early age. After I moved back to AR in 1984, we would occasionally take our own cars down to Greenville, MS and race them at a track there. I never won with my Camaro but my brother placed a couple of times with his '78 Chevy pickup and my dad won the whole thing once with his '55 Chevy. Good times and great memories. We did frequent road trips when I was a kid, some epic and some fairly straightforward. 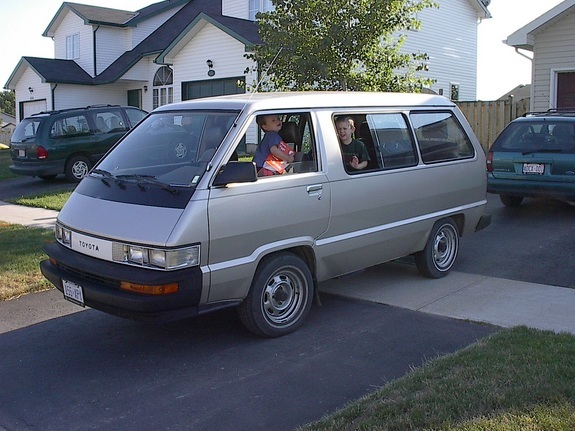 My parents always had a minivan (usually a Dodge Caravan), and through the years, the various minivans improved like backseat air conditioning, cupholders, a CD player for books on CD and eventually dual-side passenger doors. Lots of trips to Ohio, Texas and Nebraska to visit relatives and also multiple trips to Colorado for hiking & skiing. One extra long trip was a tour of the northeast including the Statue of Liberty and somehow an amusement park dedicated to Mr. Roger's Neighborhood. I was young, it's fuzzy. My parents were quite courageous in taking the 3 of us kids almost everywhere by driving, but they also had a very strict "no complaining" rule. When you can't complain, you don't tend to think about your perceived ailments (like boredom) so much. Where is the hood, you ask? It didn't need one. The engine sat elevated between the font seats and the middle row, meaning there was no leg room. Also, the engine would be hot chugging down the highway, and in the summer having that heat sitting right next to you... whew. The thing broke down so many times that my brother and I started calling it Puff the Tragic Wagon.